Introducing Ideal Protein’s new Branched Chain Amino Acids (BCAA). The BCAA supplement has been formulated for use in both the weight loss phases of the Ideal Protein Weight Loss Method and in maintenance. It is offered in a powder form and comes in a tasty fruit punch flavor. We recommend 1 packet per day mixed in 8 ounces of cold water. Branched-chain amino acids stimulate the building of protein in muscle and reduce muscle breakdown. 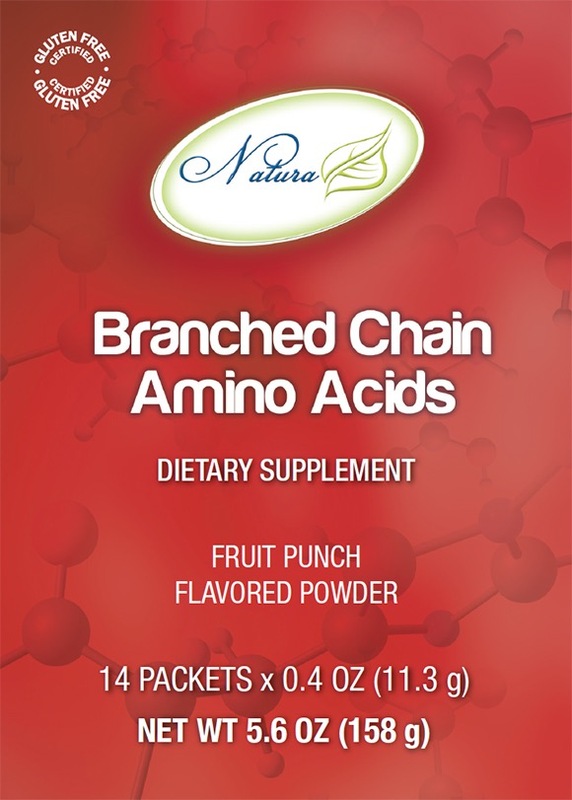 Branched-chain amino acids are essential nutrients that the body obtains from proteins found in food, especially meat, dairy products, and legumes. They include leucine, isoleucine, and valine. “Branched-chain” refers to the chemical structure of these amino acids. The advantage of the BCAA Ideal Protein supplement in building or maintaining muscle in the body is that once the 3 essential amino acids are absorbed, they are taken up directly by the skeletal muscles of the body to be used as building blocks for muscle tissue, instead of going to all the bodily cells- thus building and sustaining muscle. Read more about the importance of muscle here. Another benefit of BCAAs is that they help to improve insulin sensitivity, metabolic rate, blood sugar and increase the production of the growth hormone. This formula is different from other BCAA supplements currently on the market and is specifically formulated for use on the Ideal Protein Weight Loss Method and in the Maintenance Phase. There are three BCAAs: leucine, isoleucine and valine. BCAAs account for about 35% of the essential amino acids in muscle proteins, which is why they’re great to supplement alongside a resistance training program. BCAAs are crucial to building muscle, repairing damaged muscle tissue and muscle energy. Having muscle raises and keeps your metabolism high, which is key during a weight loss/fat loss program. Leucine is the most important of the BCAAs in terms of fat loss and building muscle so it’s important to find a product with a high ratio of leucine. While substantial BCAA intake can be obtained through proper diet, those on a fat loss program are typically on a calorie-restricted diet. BCAA supplementation can help you maintain muscle mass, keep muscular energy levels up, and even build muscle while you are dropping fat. Branched Chain Amino Acids (BCAAs) can help you achieve better results faster by helping you maintain muscle mass while you drop body fat. Losing body fat is challenging, so if you’re looking to slim down you’ll want all the help you can get. That being said, BCAAs are not a “magic weight loss solution” that’s going to do all the work for you. Effective fat loss programs require specific nutrition. When used properly, BCAAs can be a great tool to help get the job done more efficiently. Take 1 packet daily during the first 2 to 3 weeks one of Phase 1. This can help reduce muscle loss during gluconeogenesis at the beginning of the method. Add 1 packet daily if you continue to lose an exaggerated amount of lean mass after week 3. If you are not in the weight maintenance phase, it won’t matter if the BCAA’s are not consumed all at once. You can sip on it throughout the day for general lean mass support as you are losing weight, but this method does not provide enough coverage to your muscles for a work out. Maintenance: The Ultimate Pre/Post Workout Supplement! BCAA’s are extremely conducive to helping bodybuilders and athletes cut body fat while maintaining their muscle mass. Additionally, the insulinogenic effects of branched chain amino acids aren’t significant enough to halt fat-burning, yet they do provide the necessary materials for the muscle to use when glucose is low. Therefore, when your goal is to get as lean as possible while keeping training intensity at peak levels, branched chain amino acids will serve to be the perfect addition to your diet and training efforts. You will notice a considerable change in your energy levels and they also seem to function as a potent appetite suppressant. For dieters who want to start a training schedule following the weight loss method or for World Class Athletes looking for the best pre/post workout supplement, here it is! Place 14-16 oz. of cold water in a shaker. Add 1 packet of the BCAA supplement and shake. Open shaker and add 1 packet of Ideal Complete, shake again. Consume ½ before your workout, the other half immediately after your workout, or simply have the whole shake right after your workout. With 26 grams of high quality protein, the exact ratio of BCAA’s, vitamin C (for protein synthesis) and L-alanine and L-glutamine (for those following a low carb diet). NOTE: If you are on Ideal Protein phase I protocol and exercising then the BCAA’s in particular the Glutamine and B-Alanine will help keep blood sugars stable with Gluconeogenesis rather than the body breaking down more muscle. Drink the BCAAs 30 minutes before your workout. This gets the Glutamine & B-Alanine into the system and keeps the lean mass steady. You can have another one post workout, but the one immediately prior to workout is the key. So, In Ideal Protein phases 1 &2 the BCAAs needs to be taken 1/2 hour before the exercise routine in order to have it absorbed systemically to decrease the degree of Gluconeogenesis. Ideal Protein also offers a Maintenance Program to help you continue to maintain your healthy weight. I had heard that you needed to consume the BCAA’s within 20 minutes of mixing it. Is this true? If you are not in the weight maintenance phase, it won’t matter if the BCAA’s are not consumed all at once. If you are on protocol and exercising then the BCAA’s in particular the Glutamine and B-Alanine will help keep blood sugars stable with Gluconeogenesis rather than the body breaking down more muscle. Drink the BCAAs 30 minutes before your workout. This gets the Glutamine & B-Alanine into the system and keeps the lean mass steady. You can have another one post workout, but the one immediately prior to workout is the key. So, In Ideal Protein phases 1 &2 the BCAAs needs to be taken 1/2 hour before the exercise routine in order to have it absorbed systemically to decrease the degree of Gluconeogenesis. You can sip on it throughout the day for general lean mass support as you are losing weight, but this method does not provide enough coverage to your muscles for a work out.